UO Razor – UO is a free software program designed to simplify common tasks in the popular MMORPG Ultima Online. It is designed to provide a free alternative to the popular program UOAssist which works on player run servers as well as official game servers. It is written in both and for use on Windows systems. UO Razor “On the Cutting Edge” of Ultima Online game play! UO Razor is a free software program designed to simplify common tasks in the popular MMORPG Ultima Online. UOR was intended to provide a free alternative to the popular program UOAssist which works on player run servers as well as official UO game servers. It is written for use on Windows systems. 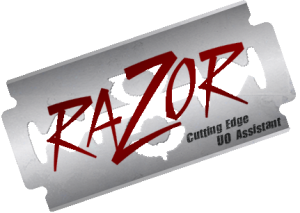 UO Razor provides nearly all of the original features found in UOAssist as well as many new features which help to streamline the game interface. In addition to these features, UO Razor provides mechanisms to record macros on common in-game actions and assign hotkeys to help users more quickly perform common tasks. UO Razor also provides a simple screen capture interface. Razor also introduces a way for players to share their game experiences through a feature called “packet video”. This features allows users to record what they see in game and distribute these tiny files on message boards. Packet video files do not contain any image data, but instead contain a copy of original game server to client communications. This allows these files to be extremely small (less than 500KB per hour in most cases). However in order to watch the videos the Ultima Online client must be installed on the user’s system. UO Razor is not an Approved Third Party Program. Therefore, using it on the Official Ultima Online Servers can get your accounts permanently Banished.